For other uses, see Cookie (disambiguation). Magic cookies were already used in computing when computer programmer Lou Montulli had the idea of using them in web communications in June 1994. At the time, he was an employee of Netscape Communications, which was developing an e-commerce application for MCI. Vint Cerf and John Klensin represented MCI in technical discussions with Netscape Communications. MCI did not want its servers to have to retain partial transaction states, which led them to ask Netscape to find a way to store that state in each user's computer instead. Cookies provided a solution to the problem of reliably implementing a virtual shopping cart. In 2016 Google Chrome version 51 introduced a new kind of cookie, the same-site cookie, which can only be sent in requests originating from the same origin as the target domain. This restriction mitigates attacks such as cross-site request forgery (XSRF). A cookie is given this characteristic by setting the SameSite flag to Strict or Lax. Normally, a cookie's domain attribute will match the domain that is shown in the web browser's address bar. This is called a first-party cookie. A third-party cookie, however, belongs to a domain different from the one shown in the address bar. This sort of cookie typically appears when web pages feature content from external websites, such as banner advertisements. This opens up the potential for tracking the user's browsing history and is often used by advertisers in an effort to serve relevant advertisements to each user. As an example, suppose a user visits www.example.org. This website contains an advertisement from ad.foxytracking.com, which, when downloaded, sets a cookie belonging to the advertisement's domain (ad.foxytracking.com). Then, the user visits another website, www.foo.com, which also contains an advertisement from ad.foxytracking.com and sets a cookie belonging to that domain (ad.foxytracking.com). Eventually, both of these cookies will be sent to the advertiser when loading their advertisements or visiting their website. The advertiser can then use these cookies to build up a browsing history of the user across all the websites that have ads from this advertiser. As of 2014[update], some websites were setting cookies readable for over 100 third-party domains. On average, a single website was setting 10 cookies, with a maximum number of cookies (first- and third-party) reaching over 800. A zombie cookie is a cookie that is automatically recreated after being deleted. This is accomplished by storing the cookie's content in multiple locations, such as Flash Local shared object, HTML5 Web storage, and other client-side and even server-side locations. When the cookie's absence is detected,[clarification needed] the cookie is recreated[clarification needed] using the data stored in these locations. Zero or more attributes (name/value pairs). Attributes store information such as the cookie's expiration, domain, and flags (such as Secure and HttpOnly). From this point on, the cookie will automatically be sent by the browser to the server every time a new page from the site is requested. The server not only sends the page as usual but also stores the URL of the requested page, the date/time of the request, and the cookie in a log file. Corporations exploit users' web habits by tracking cookies to collect information about buying habits. The Wall Street Journal found that America's top fifty websites installed an average of sixty-four pieces of tracking technology onto computers, resulting in a total of 3,180 tracking files. The data can then be collected and sold to bidding corporations. A possible interaction between a web browser and a web server holding a web page in which the server sends a cookie to the browser and the browser sends it back when requesting another page. The server's HTTP response contains the contents of the website's homepage. But it also instructs the browser to set two cookies. The first, "theme", is considered to be a session cookie since it does not have an Expires or Max-Age attribute. Session cookies are intended to be deleted by the browser when the browser closes. The second, "sessionToken", is considered to be a persistent cookie since it contains an Expires attribute, which instructs the browser to delete the cookie at a specific date and time. The value of a cookie may consist of any printable ASCII character (! through ~, Unicode \u0021 through \u007E) excluding , and ; and whitespace characters. The name of a cookie excludes the same characters, as well as =, since that is the delimiter between the name and value. The cookie standard RFC 2965 is more restrictive but not implemented by browsers. If a cookie's Domain and Path attributes are not specified by the server, they default to the domain and path of the resource that was requested. However, in most browsers there is a difference between a cookie set from foo.com without a domain, and a cookie set with the foo.com domain. In the former case, the cookie will only be sent for requests to foo.com, also known as a host-only cookie. In the latter case, all sub domains are also included (for example, docs.foo.com). A notable exception to this general rule is Edge prior to Windows 10 RS3 and Internet Explorer prior to IE 11 and Windows 10 RS4 (April 2018), which always send cookies to sub domains regardless of whether the cookie was set with or without a domain. As of 2016[update] Internet Explorer did not support Max-Age. 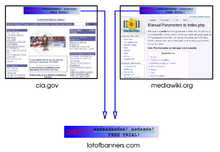 In this fictional example, an advertising company has placed banners in two websites. By hosting the banner images on its servers and using third-party cookies, the advertising company is able to track the browsing of users across these two sites. The United States government has set strict rules on setting cookies in 2000 after it was disclosed that the White House drug policy office used cookies to track computer users viewing its online anti-drug advertising. In 2002, privacy activist Daniel Brandt found that the CIA had been leaving persistent cookies on computers that had visited its website. When notified it was violating policy, CIA stated that these cookies were not intentionally set and stopped setting them. On December 25, 2005, Brandt discovered that the National Security Agency (NSA) had been leaving two persistent cookies on visitors' computers due to a software upgrade. After being informed, the NSA immediately disabled the cookies. First-party analytics cookies are not likely to create a privacy risk if websites provide clear information about the cookies to users and privacy safeguards. Listed here are various scenarios of cookie theft and user session hijacking (even without stealing user cookies) that work with websites relying solely on HTTP cookies for user identification. This issue can be resolved by securing the communication between the user's computer and the server by employing Transport Layer Security (HTTPS protocol) to encrypt the connection. A server can specify the Secure flag while setting a cookie, which will cause the browser to send the cookie only over an encrypted channel, such as an TLS connection. If an attacker is able to accomplish this, it is usually the fault of the Internet Service Providers for not properly securing their DNS servers. However, the severity of this attack can be lessened if the target website uses secure cookies. In this case, the attacker would have the extra challenge of obtaining the target website's TLS certificate from a certificate authority, since secure cookies can only be transmitted over an encrypted connection. Without a matching TLS certificate, victims' browsers would display a warning message about the attacker's invalid certificate, which would help deter users from visiting the attacker's fraudulent website and sending the attacker their cookies. Cross-site scripting: a cookie that should be only exchanged between a server and a client is sent to another party. Cookiejacking is a form of hacking wherein an attacker can gain access to session cookies of an Internet Explorer user. Discovered by Rosario Valotta, an Internet security researcher, the exploit allows an attacker to obtain a cookie from any site and thus a username and password by tricking a user into dragging an object across the screen. Although Microsoft deemed the flaw low-risk because of "the level of required user interaction", and the necessity of having a user already logged into the website whose cookie is stolen, Valotta was able to use a social engineering attack to obtain, in three days, the cookies of 80 Facebook users out of his 150 friends. If more than one browser is used on a computer, each usually has a separate storage area for cookies. Hence, cookies do not identify a person, but a combination of a user account, a computer, and a web browser. Thus, anyone who uses multiple accounts, computers, or browsers has multiple sets of cookies. A more precise technique is based on embedding information into URLs. The query string part of the URL is the part that is typically used for this purpose, but other parts can be used as well. The Java Servlet and PHP session mechanisms both use this method if cookies are not enabled. Basic web browser configuration information has long been collected by web analytics services in an effort to accurately measure real human web traffic and discount various forms of click fraud. With the assistance of client-side scripting languages, collection of much more esoteric parameters is possible. Assimilation of such information into a single string comprises a device fingerprint. In 2010, EFF measured at least 18.1 bits of entropy possible from browser fingerprinting. Canvas fingerprinting, a more recent technique, claims to add another 5.7 bits. ^ "Where cookie comes from :: DominoPower". dominopower.com. Retrieved 19 October 2017. ^ Schwartz, John (2001-09-04). "Giving Web a Memory Cost Its Users Privacy". The New York Times. ^ "Press Release: Netscape Communications Offers New Network Navigator Free On The Internet". Web.archive.org. Archived from the original on 2006-12-07. Retrieved 2010-05-22. ^ "Usenet Post by Marc Andreessen: Here it is, world!". Groups.google.com. 1994-10-13. Retrieved 2010-05-22. ^ Hardmeier, Sandi (2005-08-25). "The history of Internet Explorer". Microsoft. Retrieved 2009-01-04. ^ Jackson, T (1996-02-12). "This Bug in Your PC is a Smart Cookie". Financial Times. ^ "Setting Cookies". staff.washington.edu. June 19, 2009. ^ The edbrowse documentation version 3.5 said "Note that only Netscape-style cookies are supported. However, this is the most common flavor of cookie. It will probably meet your needs." This paragraph was removed in later versions of the documentation further to RFC 2965's deprecation. ^ Hodges, Jeff; Corry, Bil (6 March 2011). "'HTTP State Management Mechanism' to Proposed Standard". The Security Practice. Retrieved 17 June 2016. ^ "Maintaining session state with cookies". Microsoft Developer Network. Retrieved 22 October 2012. ^ "'SameSite' cookie attribute, Chrome Platform tatus". Chromestatus.com. Retrieved 2016-04-23. ^ Goodwin, Mark; West, Mike. "Same-site Cookies". tools.ietf.org. Retrieved 2016-04-23. ^ Goodwin, M.; West. "Same-Site Cookies draft-ietf-httpbis-cookie-same-site-00". tools.ietf.org. Retrieved 2016-07-28. ^ "Third party domains". WebCookies.org. ^ "Number of cookies". WebCookies.org. ^ "Learn more about the Public Suffix List". Publicsuffix.org. Retrieved 28 July 2016. ^ Mayer, Jonathan (19 August 2011). "Tracking the Trackers: Microsoft Advertising". The Center for Internet and Society. Retrieved 28 September 2011. ^ Vijayan, Jaikumar. "Microsoft disables 'supercookies' used on MSN.com visitors". Retrieved 23 November 2014. ^ Peng, Weihong; Cisna, Jennifer (2000). "HTTP Cookies, A Promising Technology". Proquest. Online Information Review. Retrieved 29 March 2013. ^ "Persistent client state HTTP cookies: Preliminary specification". Netscape. c. 1999. Archived from the original on 2007-08-05. ^ "Cookie Property". MSDN. Microsoft. Retrieved 2009-01-04. ^ Shannon, Ross (2007-02-26). "Cookies, Set and retrieve information about your readers". HTMLSource. Retrieved 2009-01-04. ^ "HTTP State Management Mechanism, The Path Attribute". IETF. March 2014. ^ "RFC 6265, HTTP State Management Mechanism, Domain matching". IETF. March 2014. ^ "RFC 6265, HTTP State Management Mechanism, The Domain Attribute". IETF. March 2014. ^ "Internet Explorer Cookie Internals (FAQ)". 21 November 2018. ^ "RFC 2109, HTTP State Management Mechanism, Set-Cookie syntax". IETF. March 2014. ^ "RFC 6265, HTTP State Management Mechanism". ietf.org. ^ "Cookies specification compatibility in modern browsers". inikulin.github.io. 2016. Retrieved 2016-09-30. ^ Coles, Peter. "HTTP Cookies: What's the difference between Max-age and Expires? – Peter Coles". Mrcoles.com. Retrieved 28 July 2016. ^ "Symantec Internet Security Threat Report: Trends for July–December 2007 (Executive Summary)" (PDF). XIII. Symantec Corp. April 2008: 1–3. Retrieved May 11, 2008. ^ Whalen, David (June 8, 2002). "The Unofficial Cookie FAQ v2.6". Cookie Central. Retrieved 2009-01-04. ^ "3rd-Party Cookies, DOM Storage and Privacy". grack.com: Matt Mastracci's blog. January 6, 2010. Retrieved 2010-09-20. ^ "How to Manage Cookies in Internet Explorer 6". Microsoft. December 18, 2007. Retrieved 2009-01-04. ^ "Clearing private data". Firefox Support Knowledge base. Mozilla. 16 September 2008. Retrieved 2009-01-04. ^ "Clear Personal Information : Clear browsing data". Google Chrome Help. Google. Retrieved 2009-01-04. ^ "Clear Personal Information: Delete cookies". Google Chrome Help. Google. Retrieved 2009-01-04. ^ "CIA Caught Sneaking Cookies". CBS News. 2002-03-20. ^ "Spy Agency Removes Illegal Tracking Files". New York Times. 2005-12-29. ^ "EU Cookie Directive, Directive 2009/136/EC". JISC Legal Information. Retrieved 31 October 2012. ^ a b c Privacy and Electronic Communications Regulations. Information Commissioner's Office. 2012. ^ "Directive 95/46/EC of the European Parliament and of the Council of 24 October 1995 on the protection of individuals with regard to the processing of personal data and on the free movement of such data". 1995-11-23: 0031–0050. Retrieved 31 October 2012. ^ "New EU cookie law (e-Privacy Directive)". Archived from the original on 24 February 2011. Retrieved 31 October 2012. ^ "EU cookie law: stop whining and just get on with it". Retrieved 31 October 2012. ^ a b "A Loophole Big Enough for a Cookie to Fit Through". Bits. The New York Times. Retrieved 31 January 2013. ^ Pegoraro, Rob (July 17, 2005). "How to Block Tracking Cookies". Washington Post. p. F07. Retrieved 2009-01-04. ^ a b c d Finkle, Jim (2011-05-25). "Microsoft latest security risk: 'Cookiejacking'". Reuters. Retrieved 26 May 2011. ^ Whitney, Lance (2011-05-26). "Security researcher finds 'cookiejacking' risk in IE". CNET. Retrieved 26 May 2011. ^ Fielding, Roy (2000). "Fielding Dissertation: CHAPTER 6: Experience and Evaluation". Retrieved 2010-10-14. ^ Tilkov, Stefan (July 2, 2008). "REST Anti-Patterns". InfoQ. Retrieved 2009-01-04. ^ "ThomasFrank.se". ThomasFrank.se. Retrieved 2010-05-22. ^ "The cookie is dead. Here's how Facebook, Google, and Apple are tracking you now, VentureBeat, Mobile, by Richard Byrne Reilly". VentureBeat. ^ "Window.sessionStorage, Web APIs | MDN". developer.mozilla.org. Retrieved 2 October 2015. ^ "Introduction to Persistence". microsoft.com. Microsoft. ^ "BrowserSpy". gemal.dk. Retrieved 2010-01-28. ^ "IE "default behaviors [sic]" browser information disclosure tests: clientCaps". Mypage.direct.ca. Retrieved 2010-01-28. ^ Eckersley, Peter (17 May 2010). "How Unique Is Your Web Browser?" (PDF). eff.org. Electronic Frontier Foundation. Archived from the original (PDF) on 15 October 2014. Retrieved 23 July 2014. Anonymous, 2011. Cookiejacking Attack Steals Website Access Credentials. Informationweek - Online, pp.Informationweek - Online, May 26, 2011. Wikimedia Commons has media related to HTTP cookies.